Though this is hair rising, heart pounding, stimulating but still different way of getting amenity through jumping. Nepal, geographically rich in such landscape where there are cliffs, rocky gorges, crevasses and big ditches and the possibilities of Bungee Jumping is in such places. Only the conditions that you should be brave enough and should not be under any serious medications. 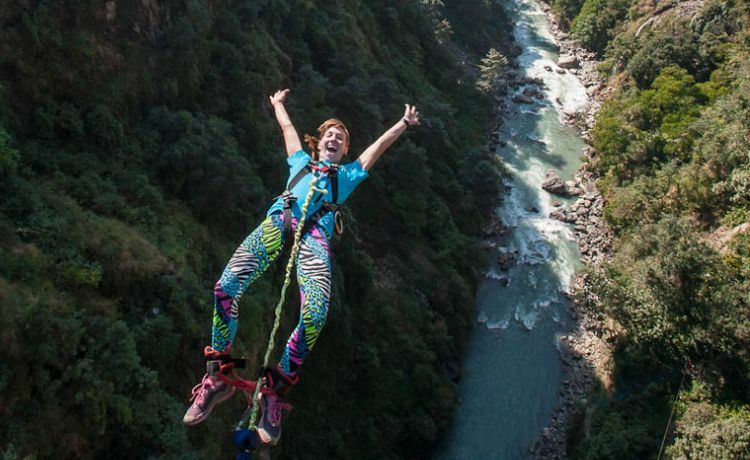 Nepal’s first Bungee Jumping is located at Bhote Koshi River, close to Nepal-Tibet border. It takes 3 hours drive from Kathmandu. The jump, at 160 m over the Bhote Koshi River gives you exotic experience of adrenaline rush in the surroundings of this amazing place. It is 100 km northeast from Kathmandu, lies at an altitude of 3600 ft. from the sea level. The steel made suspension bridge is 166 m wide over the Bhote Koshi River gorge. This can bear 4.5 tones and there are 4x safety factor. It is staffed and operated by the most experienced jump masters in this business. A package deal includes the jump, bus ride to the site, and even meals. Day 01Early morning drive to Bhotekoshi gorge, Bungee jumping,& drive back to KathmanduAfter breakfast we drive from Kathmandu to The Last Resort, built by Swiss Management. It is 3 hours drive by Araniko Highway. Finally we reach the Last Resort which is located on the top of gorge 12 km before the Tibetan border. The bridge is privately owned by Swiss Management, 166 m wide steel suspension bridge which has been designed only for bungee jumping. It has 4x safety factor and loading capacity of 41,500 kg or 4.5 tons. It is the bridge over the BhoteKoshi River. One can enjoy the free fall, delicious meal and drive back to Kathmandu. If you would like to add other program like canyoning, River rafting, we can make package for this as well.